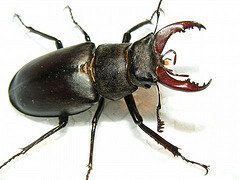 The stag beetle is Britain's largest insect and one of the most well-known of all the beetles. The male is easily recognised because of his mouthparts which have evolved into enormous jaws, resembling the antlers on a stag's head. Distribution: Southern and central Europe. In Britain, they are found in southern and southeastern areas of England. Habitat: Broad-leaved woodlands, especially oak, but also parks and gardens where there are hedgerows, tree stumps and logs. Size: Dark, violet-brown elytra (wing cases) with reddish-brown antlers (female's antlers are much smaller than the male's). Larva is creamy-white. Life-span: The larva lives 3-5 years. Adults live only between the months of May and August. Food: Larva eats rotting wood and roots. It is thought that the adult either eats tree sap or nothing at all. The stag beetle is Britain's largest insect and one of the most well-known of all the beetles. The male is easily recognised because of his mouthparts which have evolved into enormous jaws, resembling the antlers on a stag's head. Despite their fearsome appearance, these antlers are useless for biting, and are used to fight other males. It is the smaller female we need to be wary of - her tiny antlers may look less threatening but they can inflict a sharp nip!